10 years ago I attempted Russell without almost no prior 3rd class or other climbing experience. I got about half way between the First Pinnacle and the East Summit. A friend told me where I could find about 300 ft of 3rd class practice, and I have done this every week for the intervening 10 years, hoping for a rematch someday. Last year I made friends with a 'real' mountaineer, collected two other friends, and attempted Russell again. We made East Summit by 10:30, but my mountaineering friend had to turn back then: he's the vollyball coach and his team had a game at 5pm in Ridgecrest. I decided not to go on alone. At some point this year I got tired of explaining why I didn't make it all the way, and decided to hire a guide--someone who had experience and no other commitments, and make one last try. Sierra Mountain Center (I recommend them) provided a good one. We packed up to Upper Boy Scout and camped on the left side. It felt like Grand Central Station: two men camped to the west, a group of 4 to the north, two men to the East, and the canyon wall to the south--couldn't find a single pit stop location where I had what I considered sufficient privacy. Make it fast and hope no one is looking at that precise moment. It was very interesting to see how the 'pros' did it, although I found it a bit hard to appreciate the 4:30 am wakeup call. There are two good reasons for this: 1) if things go wrong, you've got more daylight to deal with it 2) you're back in camp before the afternoon thundershowers. There have been a lot of them this year. Had to buy a waterproof mattress pad for the dog after the last backpack--water ran under the tent and up through the floor. My husband and I didn't sign the register at Langley on Aug 16 because of a hailstorm, but that's another story. Russell was a done deal by 9:30 am on Saturday, Aug 30. It was almost too easy with a guide. It still felt very, very good to gain my victory over Russell, and over my fear. 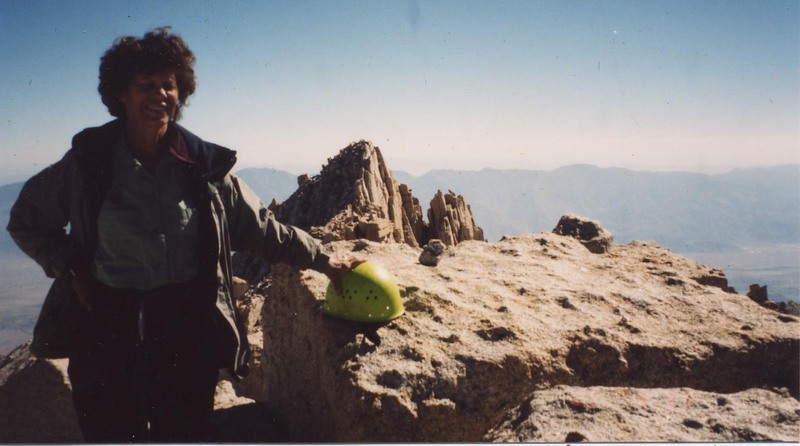 (No, I'm not the heroic type who can climb Russell, leaping along the ledges, then descend and climb Whitney, and come down the trail, stopping just long enough to do Muir, all in one day) I'm 60.7 years old and I wonder if I might be the oldest woman to summit Russell. I can still do it! The guide did put me on a rope for the ledges and the 3rd class climb down, but I never slipped, never needed it. Eric suggested we return via the Mountaineer's Route on Whitney. The 3rd class crack just west of East Summit was great fun--the kind of 3rd class I'm used to. Then across the canyon to the Whitney-Russell col, down to Iceberg Lake, and to the Mountaineer's Route. It was fun to revisit the Mountaineer's Route, and I could see immediately how easy it is to mistake the route (I've heard some stories about 'stupid' people who did): the canyon leads you directly to the foot of the Needles. To get to the Mountaineer's Route, on the OTHER side of Whitney, you need to hang a right/north and climb out of the canyon (the break in the cliff is marked by cairns). It's not obvious. We had probably the only two perfectly sunny days this summer. It clouded up on the 3rd, day, making for a cool hike out with no worries about the afternoon thundershower as we'd be long gone. Can't decide if I'd enjoy doing it again, or I'm glad to be done with the difficult terrain of North Fork Lone Pine Canyon. I think my external frame pack created some hazardous situations by shifting and putting me off balance. I would recommend using an internal frame pack on this trail for this reason.